Exploring Stone Church Cave, originally uploaded by Mic2006. When the railway engineers sealed Stone Church Cave they must have thought they’d done a pretty thorough job, and in reading E.D. Ongley’s 1965 BA. thesis, I had thought the same myself, however, on the off chance there might be some surface clues I visited this area with a friend (Jeff) and was immediately able to access the suspected Stone Church Cave as the retaining wall that had been built by the railway has collapsed. Ongley was entirely correct when he theorized that there might have been a buried system in the area, this thought being derived from his observation of an albino crayfish in the railway tunnel. There is a sizable space that leads off from the railway drainage tunnel and because of blowing air from a hole nearby I suspect that there might still be a tunnel sealed behind the retaining wall on the opposite side of the tunnel as well. When I look at that wall to the right of the above picture I suspect that I can see points from where a tunnel might lead, deeper into the rock. Just because the railway blasted their own drainage route, across the natural tunnel path does not mean that where the water now leaves the rock is where the water always left the rock. There is a low lying area nearby that has been cut off from Stone Church Lake and I wonder if the old drainage route had taken the water that was sinking from the swamp, moved it underground and then either had it meet the surface in that low lying area and from there it drained down through the rubble against the wall of the hill. I noticed that there was a seam of rock about 20 wide in this hollow that was eroded back into the side of the hill. Debris covers the natural seam, but the cleft that is made suggests that the rock is easily worn or decomposed; could this be the subterranean route by which the area is drained? 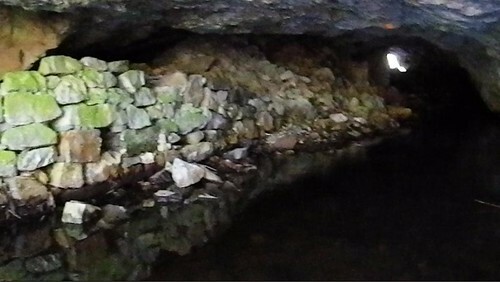 A surface search revealed a shaft leading down into the natural cave near the upstream insurgence. 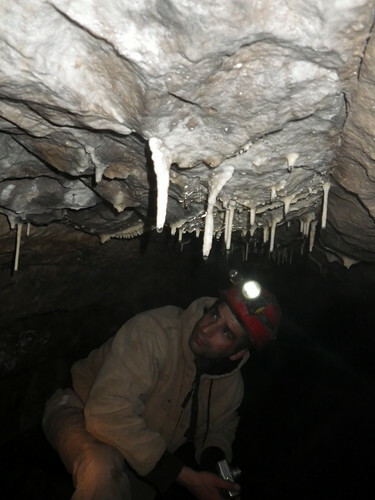 To see a short video of the exploration of Stone Church Cave – click here. Mexican Documentary, Exploring the Sian Ka’an Biosphere Reserve – Tulum, Mexico, originally uploaded by Mic2006. 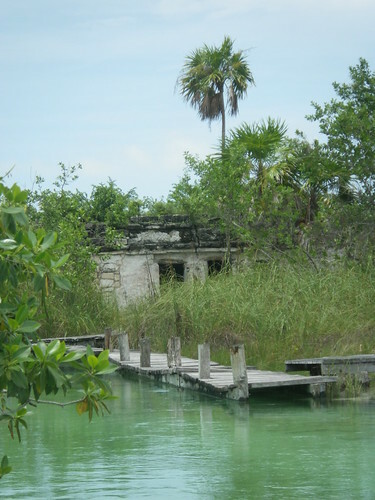 A visit to Sian Ka’an is one of the oddest experiences that I’ve ever had. Who’d think that a day in the swamp is a day well spent? And yet the haze, the turquoise water and holes from which the lake bubbled were intriguing. The Mayan ruin of Muyil is one of many Mayan treasures crumbling in the forest and sinking into this oddly scenic place. There is a very unique feeling to the landscape – nothing like the sterile desolation that the well traveled tourist ruins at Tulum have become. And in amongst the grass and crocodiles there is a rusting narrow gauge railway. There is also a channel that connects the lake in the middle of the swamp out to the Caribbean Sea, and a current of incredible strength flowing down this channel which was dug by slave long dead and sacrificed. In the accompanying video on the Sian Ka’an Biosphere Reserve, we wandered amongst the pyramids and climbed to the top of one such crumbling edifice that Manuel called the castle. It was over fractured blocks that I clawed my way up to a platform way above the canopy. One misplaced handhold would have sent me bouncing back down the pyramid – a fall that I’d not survive. I assume it was an alter that I found myself leaning on and behind me a grotto from whence I gazed across the swamp to a structure known as the Customs building. In the shadow I noticed a kneeling figure up against the wall, just a faint outline where the light caught the edges of raised plaster. It seems that the fresco must be decaying in the humidity, and the building is supposedly slowly settling into mud. Cave vandalism – Galt Shelter Caves, originally uploaded by Mic2006. As JC was in the process of studying for a test today, we could only make a short trip. Our excavation of the Tooth Tube will have to wait till next Saturday. We initially visited a place near Paris called Sinkhole Swamp and that was a bust though the place was quite beautiful. I suppose we should have known it from the start, the whole area is too thickly overlain by till. 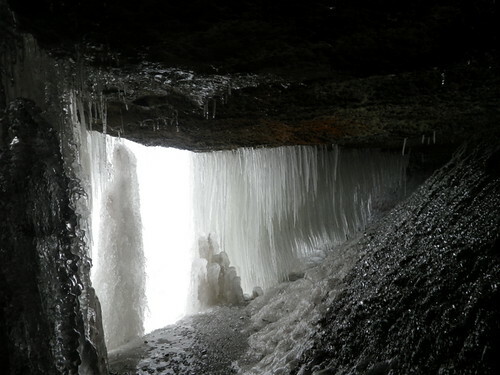 On the way back to Guelph we made a diversion to the Galt Shelter Caves as I had never seen them. I believe I had first learned of the Galt Shelter Caves from Ongley’s Manuscript. 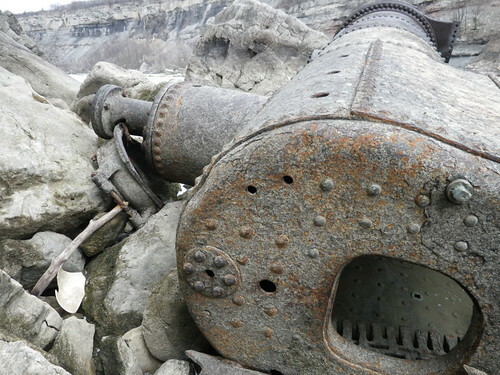 He described them as “small”, I add to that description, “shallow nooks in the cliff along the shores of the Grand River – humble in appearance, and by the added blight of spraypaint, not worth the struggle down the cliff face and through the vicious thorn bushes”. Some of the features were in the upper portion of a heavily fractured cliff face. We climbed a short way to access most and where for the most part pretty disappointed. 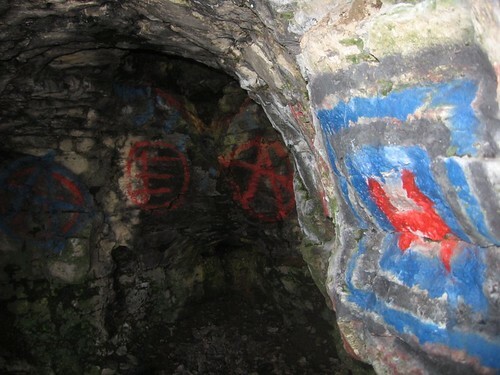 There was nothing but gutted hollows – cave vandalism at its worst. Fortunately I don’t believe there were any formations to break, just the usual empty cavities of a shelter that had been worn by running water. Two things that work against preservation of these features, firstly they are well known by local kids, and secondly, they are easily accessible as they are literally within an urban area. Can you imagine the impact of people who did this kind of thing visiting LS Cave or Rovers or the Tooth Tube or P Lake Here. I am very selective about whom I share locations and this is why..